A man was caught on camera after he allegedly tunneled into a store in La Verne, popping out from a hole in the wall while wearing a white mask and crawling around on his knees in a bizarre robbery attempt Monday. In over 40 years of business, the owners of the Inland Dairy Store at the corner of White Avenue and First Street near the L.A. County Fairground say the store has never been broken into, let alone in such a strange way. The owner, who didn't wish to be identified, said he couldn't believe what he saw when he reviewed the video with police. 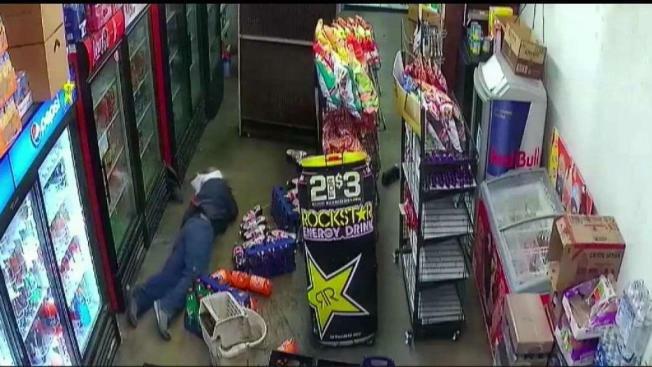 The surveillance video shows the man suddenly pop out from a tiny space in between two refrigerators, knocking a soda display to the ground. The sodas explode on impact. The man, identified by La Verne police as Rudy Mindiola of Pomona, crawls around on his knees for several minutes trying to open doors. The only time he gets up on his feet is when the alarm is triggered and he bolts back to the tiny hole police say he made to crawl inside. La Verne police officers responded minutes later at 4 a.m. Police found a hole in the wall of the store when conducting a perimeter search. 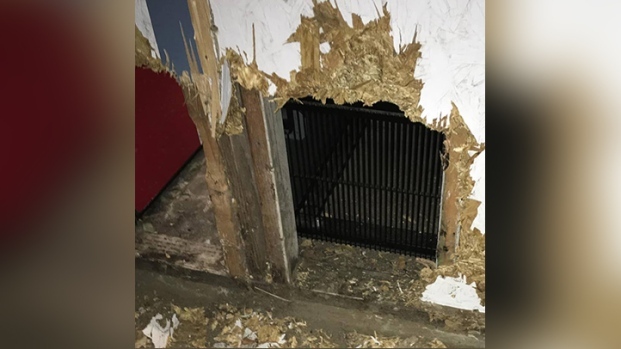 Police found a hole in the wall of a dairy store and then found a suspected burglar not long after that in La Verne, Monday, Aug. 20, 2018. They said they ultimately found Mindiola hiding in some brush along the nearby train tracks. Mindiola faces commercial burglary charges after police said they found specific tools when they arrested him. It's not immediately clear if Mindiola has an attorney who can speak to his arrest.